A Scots demolition company has reached the final stages of a worldwide awards scheme at the first time of asking. And it’s aiming for a double. Central’s Hitachi in action at East Kilbride. 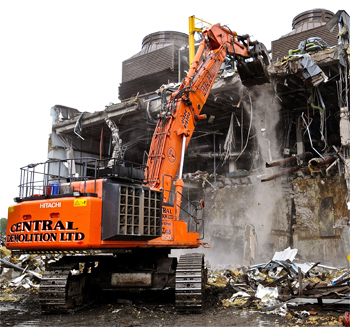 Another Scottish business, Hunter Demolition, is in a two-way race with an American company for the title of Recycling & Environmental Award for its work at the former Davidson Papermill in Mugiemoss, Aberdeen. 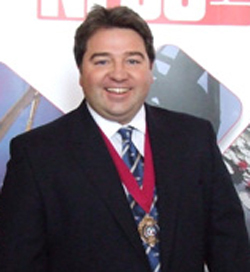 Scotland is also represented on the judging panel by William Sinclair, managing director of Dundee-based Safedem and president of the National Federation of Demolition Contractors. 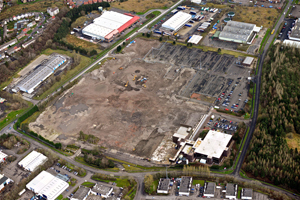 Central’s project competing in the Industrial Demolition category is the Freescale Motorola site in East Kilbride, described as “a large-scale and challenging project”. The company worked in a ‘live’ office environment and was required to protect highly sensitive testing equipment in an adjoining building. Other key criteria to be considered were the residual risks of hazardous substances, the high and low voltage cables feeding the site and the risk of an unplanned steel structure collapse. Around 24,000 tonnes of scrap and 50,000 tonnes of concrete were recycled to achieve a recycling rate of 95% by weight volume. The contract was brought in ahead of programme and on budget for client Clowes Developments (Scotland) Ltd. Central faces competition from Australian, New Zealand and Netherlands companies for the ‘industrial’ prize. It is also one of seven shortlisted contenders for the Safety & Training Award. Safedem’s Sinclair is one of the judges. Hunter’s scope of works at the former papermill included asbestos removal and soft strip/removal of deleterious materials and the contractor employed standard reach and high-reach demolition techniques. Structures ranged from small, single-storey brick buildings up to 20 metre high x 250 metre long steel portal frames. The contract was particularly challenging because of the size of the site – almost 300,000 sq. metres – and other factors such as a 100ft high brick chimney that had to be retained and was close to other buildings schedules to be demolished. The geography of the site, with a difference of 14 metres in height from one end to the other, affected the contractor’s approach to the works. Wildlife also had a say in how the job was carried out. A number of otters have their dens within the bank of the River Don, ducks, herons, geese and cormorants nest and feed by the river while a peregrine falcon watches over everything from its nest on top of the chimney. Hunter won the Contract of the Year in 2013 for its work at the former Bank of Scotland building on Queen Street in Glasgow city centre which was cleared to make way for a £50m office and retail scheme being developed and built by BAM. Click on http://bit.ly/1lJS2oS and go 1 min. 55 secs in to see Hunter Demolition collect the top award last year. Central and Hunter are two of the nine UK companies that dominate this year’s shortlists with Keltbray leading the way in contesting four categories. The other firms are Cantillon Ltd, Walters, AR Demolition, Coleman & Co., Erith Group and Micor Ltd. In addition, Powerscreen and Terex Washing Systems are on the shortlist for the Innovation Award.